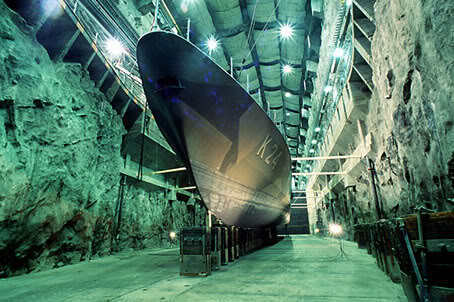 Located in Sweden, Muskö underground military facility is the world's largest underground military facility. Used for the Naval Station. Built under a granite mountain, so It's impossible to destroy with cannon, fragmentation bomb bunker even though the nuclear missiles. Musko used to manufacture ships Frigate, Destroyer ships and submarines has the longest pier reaches 350 meters. There was a repair ship, hospital, dining rooms, barracks, mall, meeting rooms, etc. All under the mountain. There is also hospital. If there is a war thousands of soldiers wounded / injured could be treated inside the hospital with a capacity of 1000 beds reach.